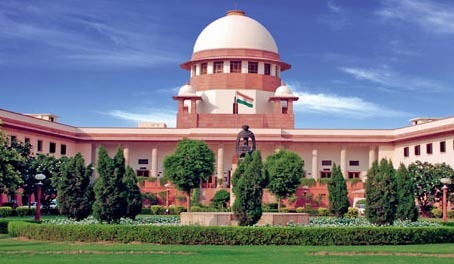 New Delhi: A day after the Constitution amendment bill that provides for 10 per cent reservation for economically backward sections in the general category was passed from the Parliament, a petition was filed in the Supreme Court on Thursday challenging the new provision. The petition, which has been filed by a group called Youth for Equality and Dr Kaushal Kant Mishra, says the amendment violates the Supreme Court’s 50 per cent ceiling. The apex court had laid down certain basic features of the Indian Constitution that cannot be altered through amendments by Parliament, it said. On Wednesday, the Rajya Sabha passed the Constitution Amendment Bill, which seeks to provide 10 per cent reservation for economically backward sections in the country in the general category, media reports said. The demand by some Opposition parties that the bill be sent to a select committee for scrutiny, was turned down. The bill, which has now been passed from both Houses of the Parliament, now waits for the President’s approval to become a law. Even as the Opposition claimed that the move is an “election stunt” of the BJP as the country is heading towards the General Elections in less than 100 days, the bill was passed in the Rajya Sabha with the support of the rival outfits. Unlike the lower house, the BJP lacks majority in the Rajya Sabha. Social Justice and Empowerment Minister Thawarchand Gehlot tabled the Constitution (124th Amendment) Bill, 2019 in the parliament. In the Rajya Sabha, the bill got the support of 165 MPs. Only seven lawmakers voted against it. The bill, which is seen as a crucial move by the government before the Lok Sabha polls, is seeking to provide 10 per cent reservation for economically backward sections in the country in the general category in government jobs and even in higher educational institutions. The bill is likely to benefit a huge section of upper castes including Brahmins, Rajputs (Thakurs), Jats, Marathas, Bhumihars, and several trading castes including Kapus and Kammas. The economically deprived from other religions will also benefit from the bill’s application. “Delighted the Rajya Sabha has passed The Constitution (One Hundred And Twenty-Fourth Amendment) Bill, 2019. Glad to see such widespread support for the Bill. The House also witnessed a vibrant debate, where several members expressed their insightful opinions,” Prime Minister Narendra Modi tweeted. He said the passage of the bill means victory for social justice. In the Lok Sabha on Tuesday, 323 lawmakers voted for the bill and only three opposed it.